Put chocolate in a dry, clean bowl and melt in microwave oven in 30-second intervals, stirring till you get a smooth paste. Remove and let cool. In a stand mixer, or a hand mixer, cream together butter and sugar till mixture is fluffy and sugar has been cut in well. Add eggs, one at a time. Beat on med-high speed for about 20 seconds after each egg, and scrape down before adding the next one. Add dry ingredients in three portions, interspersing with the yogurt and milk and stir gently. So basically, this means 1/3 dry ingredients, yogurt, 1/3 dry ingredients, milk, final third dry ingredient. Stir till all traces of flour is gone. Take out half of the vanilla cake batter and drop it into the baking pan. Add the melted chocolate and cocoa powder and Grand Marnier (if using) to the remaining batter and stir it. Interspersing globs of vanilla batter with chocolate batter, drop batter into pan. Using your spatula, twirl the batter together using a figure-eight motion to mix the batter up to get that nice pretty marble design. Don’t overmix. Smooth out the top of your pan and put cake in oven to bake. If you’re using loaf pans, start to test the cake after about 40 minutes. 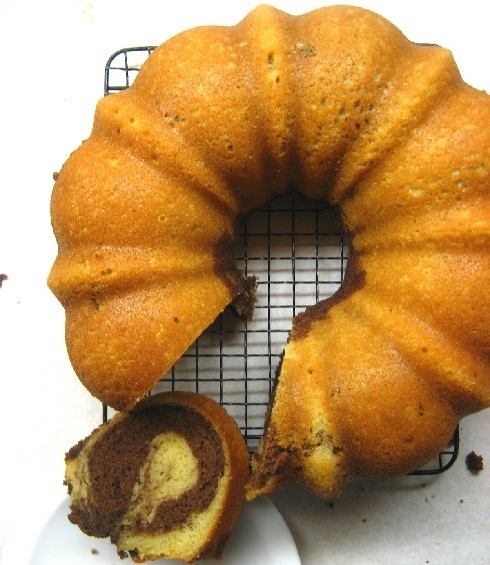 If using your bundt, it will need about 1 hour (test after 55 minutes). Cake tester should come out clean when it’s done.